One of the things I love the most about financiers is how moist and tender they are – their texture is really amazing. Besides that, financiers are a great way to use up frozen egg whites and they’re perfect for a baking urge as well – you don’t have to wait for the butter to soften to make these little beauties. Preheat the oven to 190°C/375°C; butter eight ¾ cup (180ml) capacity financier or muffin molds (I used this pan). In a large bowl, sift together the almond meal, all purpose flour and icing sugar. Set aside. In a large bowl, with an electric mixer, whisk the egg whites and salt until foamy. Add the almond flour mixture, beat well, then gradually drizzle the butter over the mixture, whisking well. Add the 6 tablespoons dulce de leche and whisk until evenly incorporated. Pour the batter into the prepared molds, filling each about ¾ full. Place about 1 teaspoon of the extra dulce de leche in the center of each financier then, using a toothpick, marble the dulce de leche with the batter. Bake for 15-18 minutes or until the financiers are golden and a skewer inserted in the financiers comes out clean. Let the financiers cool in the molds for 8-10 minutes, then carefully unmold onto a wire rack. Let cool completely. 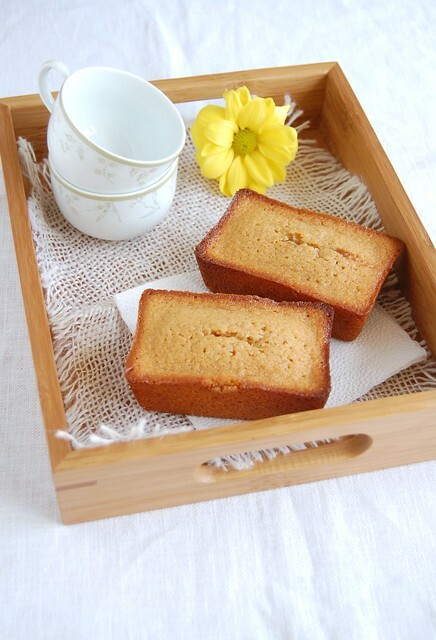 Financiers can be kept in an airtight container, at room temperature, for up to 3 days, or 5 days in the fridge. "DDL frenzy" - love it! Let it continue - lovely financiers. I love the photography that accompanies all of your recipes. Good work! These sound good and decadent! What a great idea! Everything with Dulce de Leche is so so delicious! Thank you for sharing!